The Roots are tapping into their resources to help raise funds for their alma mater in Philadelphia. The Grammy-winning Hip-Hop band created the CAPA Foundation after learning that $1.1 million had been cut from the budget of the Philadelphia High School for Creative and Performing Arts. Budget cuts resulted in the loss of 19 teachers and staff members since 2012. Funding for clubs and extracurricular activities has been eliminated, and the school's annual theater production was canceled. "I'm taking this as a state of emergency," said Roots drummer Ahmir "Questlove" Thompson. He and band member Tariq "Black Thought" Trotter formed the band in 1987 after meeting at CAPA, regarded as Philadelphia's premiere performing arts high school. The members of Jimmy Fallon's house band The Roots are raising money for their alma mater in Philadelphia - the Philadelphia High School of Creative and Performing Arts. They have created the CAPA Foundation in an effort to generate funding for new books for students and hope to keep after school activities in tact. 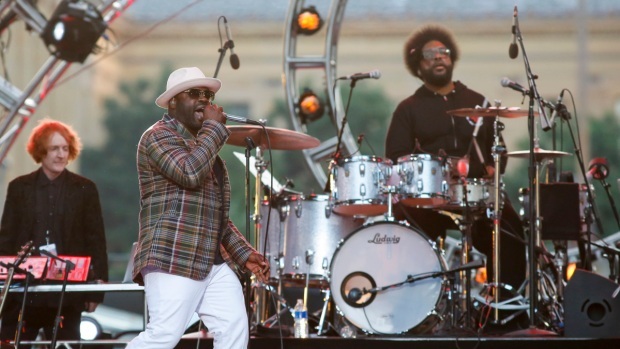 The Roots are the house band for NBC's Tonight show. Other musical artists including Boyz II Men and Jazmine Sullivan attended the high school. "It cultivated us. It educated us," Thompson said of CAPA. "This is more than just pay it forward or celeb guilt. This is necessary. ... It keeps you out of trouble. It helps develop your personality. If you take that away, you're just a machine." Thompson considered donating $1 million, but his manager persuaded him to use his relationship with corporate sponsors. The drummer said there are a few companies willing to help, and a "substantial" amount has been donated, with "seed money" from Thompson and Trotter. The nonprofit organization aims to raise $500,000 annually for the first five years and then $1 million annually after that, Thompson said. CAPA plans to provide funding for purchasing books and classroom supplies, restoring clubs and after-school activities and renovating CAPA's theater. "We're lending our celebrity to a school where we began," Trotter said. "In essence, it's literally a back-to-the-roots situation for us."